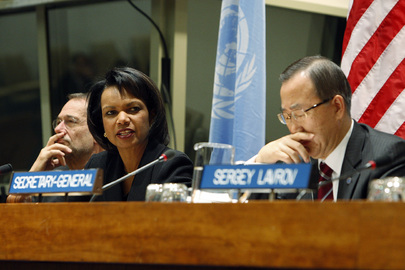 UNITED NATIONS, April 15 -- In investigating the murder of Benazir Bhutto, the UN Commission of Inquiry lead by Chile's Heraldo Munoz was urged to interview Condoleezza Rice, Hamid Karzai and the intelligence chiefs of the UAE and Saudi Arabia. When Munoz unveiled the report on April 15, Inner City Press asked him pointedly if he had, in fact, been rebuffed by Condi Rice and by Saudi Arabia's Mugran bin Abdul Aziz. Munoz said that while some had declined to be interviewed, the Commission had received information that it needed. Inner City Press insisted -- did he interview Condi Rice or not? No, Munoz conceded. Condoleezza Rice had said she was "not available." Video here, near end. Why would a former U.S. Secretary of State refuse to meet with the UN Commission of Inquiry into the death of an icon like Benazir Bhutto? Condi Rice's spokeswoman Carolyn Beswick has said that Mr. Rice "does not give interviews." After the press conference, Inner City Press asked Munoz fellow panelist Marzuki Darsman, the former attorney general of Indonesia, if he had interviewed Mugran bin Abdul Aziz. The answer was no, and also no for former US Ambassador to the UN Zalmay Khalilzad, intimitately involved in negotiating Benazir Bhutto's return to Pakistan. As Inner City Press told Pakistani television channels after the press conference, the report thus raises more questions. Watch this site. Footnote: Pakistan's Ambassador Haroon, who had be slated to speak with the Press at 5:15 at the Security Council stakeout, canceled that appearance at the last moment -- but not before the 15 Council members' flags had been moved to cover up the words "Security Council" on the backdrop behind the microphone. Is Pakistan worried about being put, like Afghanistan, on the Security Council's agenda? UNITED NATIONS, April 14 -- After the killing of five UN staff at the Bakhtar Guesthouse in Kabul last October and since, the UN has cast the blame for all the deaths on Taliban insurgents, who attacked the guesthouse. Inner City Press was told by sources in Afghanistan that, in fact, Afghan government security forces were responsible for most of the deaths, including the "summary execution" of UN Security Officer, Louis Maxwell, a U.S. citizen. Wednesday in response to questions from Inner City Press, the UN Spokesperson's Office confirmed the UN's heretofore undislosed awareness of the controversy, and later said that a board of inquiry has been established and Mr. Maxwell's family consulted. 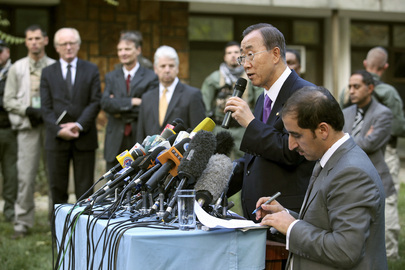 Inner City Press' sources in Afghanistan, however, say that the UN Secretary General Ban Ki-moon has shown a decided lack of enthusiasm to raise the issue to the Afghan government. Three of the four other UN staff killed, in this account, were killed by Afghan national security forces. At Wednesday's noon briefing, Mr. Ban's spokesman Martin Nesirky said that Ban has raised it to Afghanistan. Inner City Press asked, why didn't Mr. Ban or the UN publicly say that their previous account, that all five deaths were caused by the Taliban, had been called into question, including by a video shot by Germans in Kabul and shown on Der Spiegel's web site? Inner City Press is told that Louis Maxwell, who resisted the attackers and thus allowed many others to successfully escape, was summarily executed at point blank range by an Afghan National Army member while in their custody, unarmed and not offering any resistance. The extra-judicial killing was captured on video by a staff member of the German Embassy and copies were provided to UN investigators. The video has since been posted on the German 'Der Spiegel' media site although they have failed to realize (or at least publish) what exactly it is they are airing. "In the aftermath of the incident many Afghan security forces are interviewed on camera by the local Afghan media and one Army Officer admits killing an 'Arab' terrorist outside the guesthouse. (Mr. Maxwell was an African American). Irrespective of whether he was mistaken for one of the attackers, his killing was nothing short of murder. The source continues, UN SG Ban has refused to allow the issue to be raised with the Afghan government for political reasons and wants the US authorities to handle the 'problem.'" While the UN is now belatedly saying they are investigating, the approach seems at odds with the stated commitment to staff safety, and to truth. We will continue to pursue this. Watch this site. Update: while, after the noon briefing, the UN Spokesperson's Office read out a statement that the FBI is involved and nothing more will be said, the question remains why false impressions were left -- and also, what was known when, and what was done. Developing. The United Nations has followed due process in investigating the death of staff in Afghanistan last October by instituting a Board of Inquiry after an initial fact-finding by staff in Kabul and New York. The United Nations has been in contact with the responsible Afghan authorities in the course of its inquiries. The Board will submit its report in due course. Further actions by the United Nations will depend on its findings. The specific circumstances in which Louis Maxwell died are currently being investigated and it would be premature to comment further at this stage. The United Nations is also cooperating with the Federal Bureau of Investigation in its inquiries into the incident. The United Nations has briefed the Maxwell family on the progress of its initial inquiries and is determined to support the family.